What can we say, Beyonce knows class and how to carry it. This ring has been said to be Beyonce's Push present from her Husband Jay-Z, its believed to be an 8 - 10carat cushion cut Natural Tanzanite. Seems like a relevant gem for having baby 'Blue Ivy'. We love Anna Kournikova's fancy Canary Yellow Diamond Engagement Ring, which was talk of the Jewellery and tennis world back in 2010. Yellow Diamonds are still making a strong presence in the Engagement ring world! If a yellow diamond is a little too heavy on the hip pocket for you, Yellow Sapphires are making a strong influence instead as the feature gem in unique Engagement rings. Happy New Financial Year everyone! We hope that you all had a successful year! May this New Year ahead bring you much wealth and success. We are kicking the New Year off with in true style here at Torres Jewel Co, with this Perfect Matching Set of Natural Colombian Emeralds. This stunning collection is an absolute one off, we had these individually hand cut specifically for us! 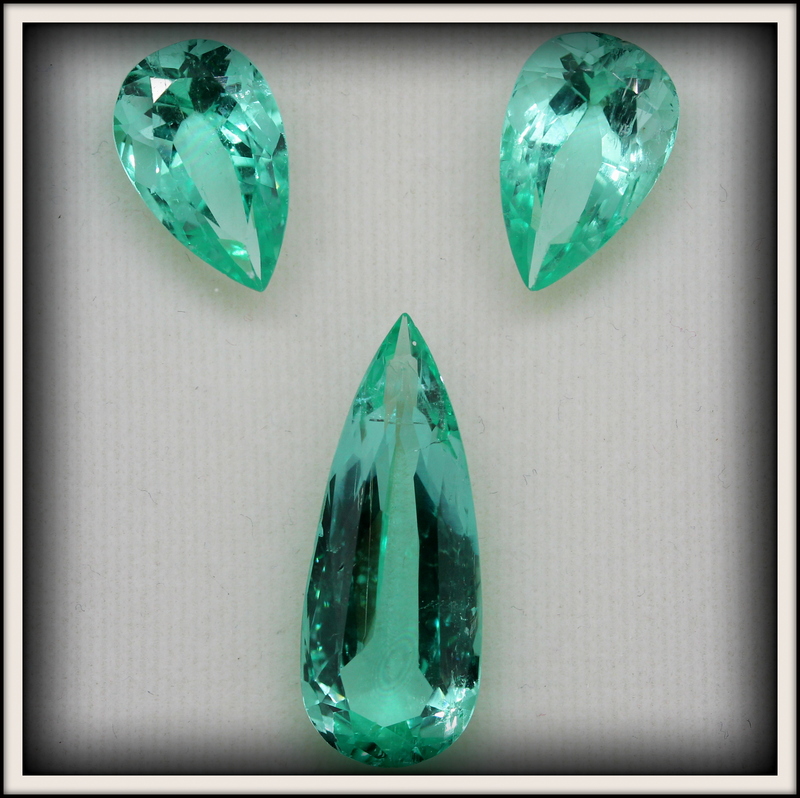 The total carat weight is: 16.20ct. We would love to invite you into our new space on Little Collins St. Melbourne, and create something truly special for you… There is also a little surprise awaiting the new owner. The Torres Jewel Co. Team. The shape of a diamond reflects it character and different people are attracted to different shapes. There is a common misconception that all diamond rings look good on all fingers, but that's not quite true because some diamond shapes look more striking on some fingers than others. The quality of a diamonds are evaluated using 4 primary characteristics known as the 4C'S - cut, color, clarity and carat. There is a wide range of diamond sizes and qualities available within any given budget. The challenge is to determine which of the 4C's is most important to you in order to narrow this range so you can make the best choice. Diamond Cut The cut of a diamond determines its brilliance and sparkle. Cut is important because it is a direct indication of the brilliance and sparkle of a diamond. Diamonds with perfect clarity or color but which are badly cut can appear dull and lifeless, but finely cut diamonds can in many cases be brilliant even if with average or below average color and clarity. The better the cut, the more rare and the more valuable is the diamond. Diamond Color The color of a diamond results from light passing through chemical impurities and/or defects is the crystalline structure. These inclusions alter the amount of light absorption pattern so that color is visible to the human eye. While diamonds come in many colors and many hues, the most common color and hue is yellow. The amount of yellow hue is graded according to a scale which ranks rewards the lack of color with the highest letter grades and which ranges from D (colorless) to Z (heavy yellow). Diamond whose color is beyond Z are denoted as "fancy" diamonds are are graded using their own scale and terminology. The purer and more intense the color, the rarer and more valuable is the diamond. Diamond Clarity The clarity of a diamond is a measure of the number and type of inclusions within the diamond and on its surface. The fewer the inclusions visible under a 10X magnifier, the higher the clarity grade which ranges from flawless to heavily included. Diamond Carat Weight The term "carat" refers to the weight and size of a diamond. The value of a diamond rises exponentially with its size. Most diamonds fall in between 0.01 carat and 1.00 in size. Put another way, that range is between a hundredth of a carat and a full carat in weight. The week of the Valentine (14th February)! Diamonds, Gemstones and all things Jewels! Present your loved one with a Natural Gemstone, a timeless keepsake that took hundreds of thousands of years to naturally occur in the earth... and they will never forget you!!! Here are a few beautiful rare gems to get you thinking,you can present them to your partner loose-as they are or have them put in diamond jewellery of your choice!